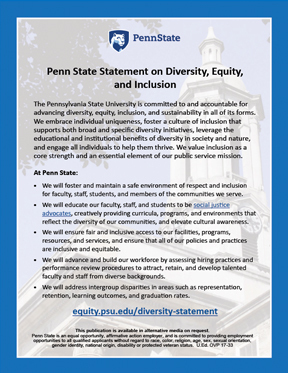 The Pennsylvania State University is committed to and accountable for advancing diversity, equity, and inclusion in all of its forms. We embrace individual uniqueness, foster a culture of inclusion that supports both broad and specific diversity initiatives, leverage the educational and institutional benefits of diversity, and engage all individuals to help them thrive. We value inclusion as a core strength and an essential element of our public service mission.